R* has been doing very well with her swimming this year. At the beginning of August, we sent her to a watersports week at a local lake. 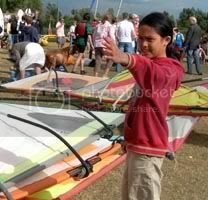 She tried out dinghy sailing, wind surfing and kayaking. She enjoyed the sailing and felt she was good at wind surfing. Of course, you can see my cunning plan here, can't you? Get the family sailing, one at a time.